The Raiders are one of the most iconic franchises in sports. Despite their lack of success the past fifteen years, they still remain one of the most recognizable and popular teams in sports. Al Davis did a remarkable job setting the tone for his football club and creating some of the most legendary teams and players in the 20th century. Later on after the franchise moved to Los Angeles, their popularity exploded when their logos and imagery was used in Hip Hop music and culture. I have always considered the Raiders my second favorite team. 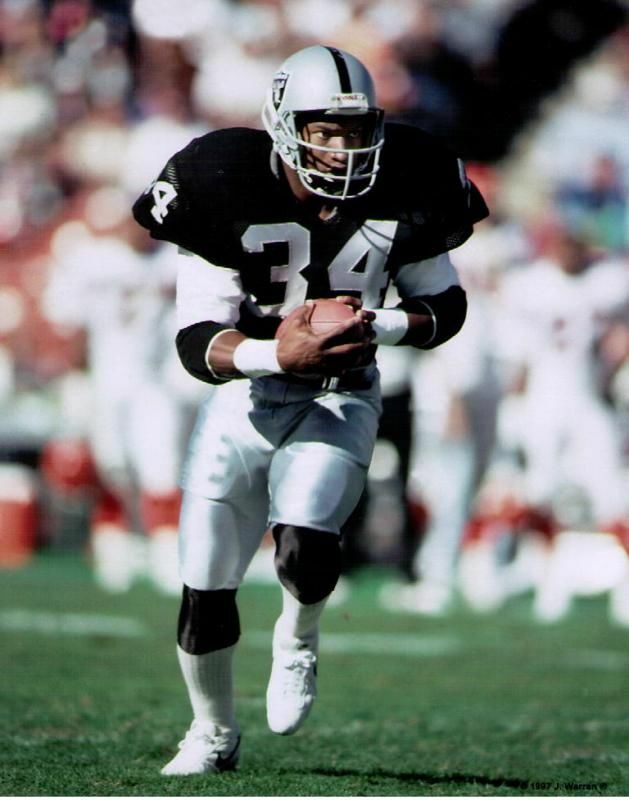 Back in 1986 I received a Marcus Allen shirt and one of my favorite athletes of all time was the great Bo Jackson. Being a naive little boy I did not realize that rooting for both the Bills and the Raiders could cause problems if they were both good teams. A prime example of this is when the bills and Raiders faced off in the 1990 AFC championship. The Raiders though, are just too cool to not root for. The Raiders were founded as an original AFL team in 1960, where team owner, Chet Soda (what a name), wanted to call the franchise the Oakland Señors. After a good amount of ridicule the ownership group came to their senses and decided on the Raiders. They designed a logo of a pirate with a football helmet on, but it was not used on any of the Raiders early uniforms. Instead, the Raiders went with a plain black helmet. At that time the Raiders did not have the iconic black color scheme, but instead went with a similar color scheme of their future bitter rival Pittsburgh Steelers. A gold stripe was added to the helmet in 1962. In 1963 the Raiders hired a fiery Brooklyn native named Al Davis to be head coach and general manager. One of Davis’ first tasks was to get rid of the black and gold colour scheme for the now familiar Silver and black. He also tweaked the little used Raiders official logo, adding the word Raiders to the shield and adding a pirate character who was the likeness of actor Randolph Scott. Kind of Spooky when you compare them now. Finally in 1964 Al Davis would change the Raiders logo to the familiar logo we know today. Davis would leave the Raiders for a short time to become the AFL commissioner and was instrumental in the NFL/AFL merger. Once the merger was agreed to Davis would return to the Raiders as part owner and run the team until his death in 2011. 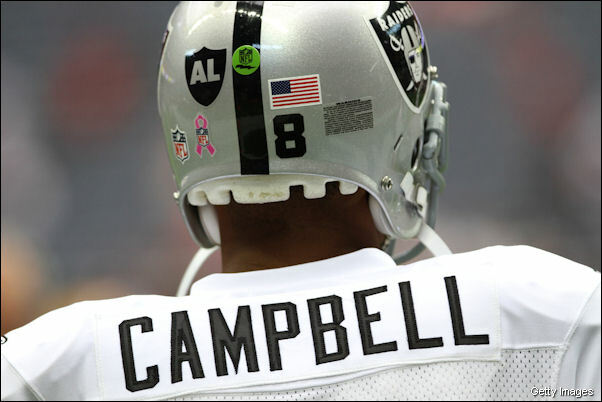 Team has worn an Al decal on their helmets since his death. Seeing as the Raiders have been my second favorite team since I was six years old, I decided to do their helmet. I started off with a plain white helmet that needed lots of putty to fill in the numerous gauges and scratches. I used Bondo spot putty, which can be picked up ant any auto parts store and filled in as much of the damage as I could. Once the putty was dry I wet sanded it until I had a smooth finish. Bondo Spot Putty does a great job resurfacing a damaged helmet. Once I sanded the helmet smooth I used gray primer (not pictured) and then covered it up with Rust-oleum metallic silver spray paint.